On this day in 1699, Guru Gobind Singh founded the Khalsa Panth, initiated the Panj Piare, created unity among his people, and stopped the tradition of gurus as the authority in Sikhism. To learn more about the significance of the Guru Gobind Singh, the Khalsa Panth, or the Panj Piare, read this past post on the Guru Gobind Singh. 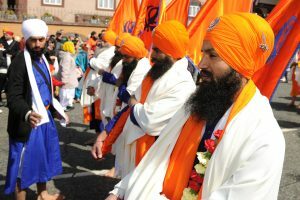 Photo of Vaisakhi parade in Birmingham, UK in 2013. Photo courtesy of Flickr user Guy Evans. For decades, New York City has hosted a Sikh Day Parade every year (this year on April 27). Thousands of Sikhs from across the country will come to share their traditions. The most popular aspect of this parade is the langar, which is served in Madison Square Park. Langar is the Sikh word for free food served to anyone who wants it. Every gurudwara in the world has the facilities to distribute free meals to the community, and langar is an important part of many Sikh celebrations. Even if a community does not lead a procession through the streets, the celebration of this event always includes singing the hymns from the Guru Grath Sahib, as well as accompanying music and dancing. In addition, many Sikhs choose to be initiated into the Khalsa Panth (like a baptism) on this day. Palm Sunday, also known as Passion Sunday, is a movable Christian holiday that falls on the Sunday before Easter. It is also the first day of the Holy Week and the beginning of the final week of Lent. The holiday commemorates Jesus Christ’s triumphal entry into Jerusalem, an event mentioned in each of the four canonical Gospels. Christians also use Palm Sunday to reflect on the last days of Jesus' life and his sacrificial death on the cross. They praise God for the gift of salvation, and anticipate the second coming of Jesus as well. Many liturgical churches celebrate the holiday with the blessing and distribution of leaves of the date palm or twigs from locally available trees. This represents the palm branches the crowd placed in front of Christ's path as he rode into Jerusalem, before his arrest on Holy Thursday and his crucifixion on Good Friday. The scarcity of palm trees in colder climates led to their substitution with branches of native trees, including box, olive, willow, and yew. The Sunday is often named after these substitute trees, as in Yew Sunday, or by the general term Branch Sunday. The palms/branches are often taken home by the members of the congregation to serve as sacramentals (sacred signs of the sacraments), and some of them are burned the following year to serve as the ashes for Ash Wednesday.